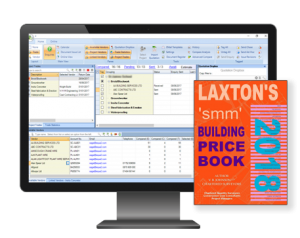 Eque2’s leading estimating solution EValuate now features full integration of Laxton’s Building Price Book information, making it simple for users to quickly and accurately price jobs using Laxton’s resource rates and build ups. The exclusive partnership provides new and existing EValuate customers with access to material and labour costs as well as in depth industry information, available both in SMM7 (Standard Method of Measurement) and NRM2 (New Rules of Measurement) versions. Established in 1817 and updated annually, the Laxton’s Building Price Book is the leading resource of its type and is used by organisations at every level of the supply chain. Many months of personnel hours are invested each year in updating the now vast library of information to determine the most up to date figures and to factor in new industry innovations. EValuate construction estimating software is suitable for businesses of all sizes and delivers fast, accurate and consistent estimation and quote comparison. It also integrates seamlessly with Eque2’s contract management and finance packages to provide a complete solution for the entire project lifecycle. EValuate has become the fastest growing construction estimating solution in the UK, used by contractors of all sizes including Lendlease, Cheesmur Building Contractors, Cara Construction and Lindum Group. EValuate is also tooling up the estimating stars of the future, being used by students on vocational courses such as those at the City of Glasgow College. With the incorporation of Laxton’s, EValuate allows estimators to accurately price jobs using either the Laxton’s data or their own uploaded libraries. For main contractors and developers, it helps them accurately compare subcontractor quotes and tenders. Carolyn Clay, Director at Laxton’s commented: “The inclusion with Eque2’s software marks the next stage in the development of Laxton’s. As a modern estimating software solution, EValuate represents the ideal vehicle to bring our offering to an even wider audience.